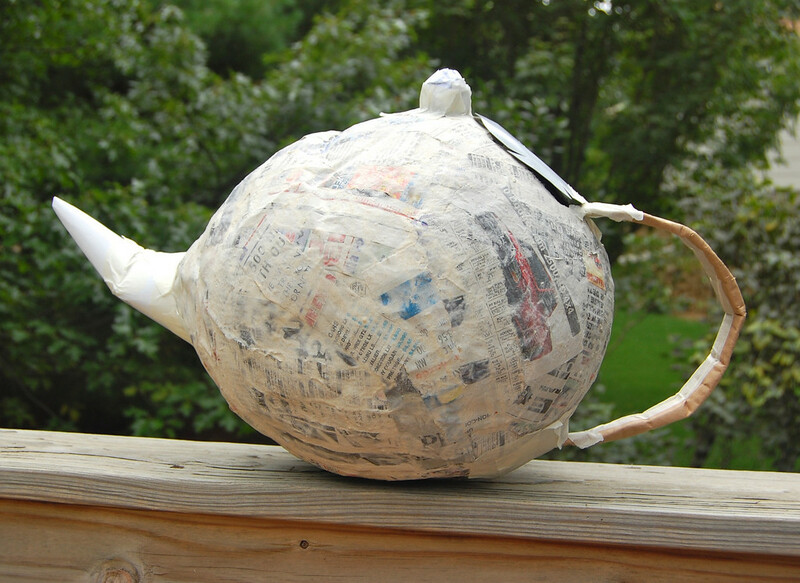 We only made one thing of papier mache for the party - the teapot pinata. We used the flour-and-water-and-salt recipe (equal parts water to flour and a teaspoon of salt for anti-mould purposes) for the paste. Last year we used white glue and water. Having tried both, I'll say that I much prefer the glue and water version, even if it is one thousand times messier. Maybe it's something to do with how glue hardens in a plasticky binding-y way while flour does it in a rock-brittle-plaster-y way, I dunno. We liked that everyone could help make it and paint it. And unlike the Hello Kitty pinata, we were not bound to the official licensed-character colors. 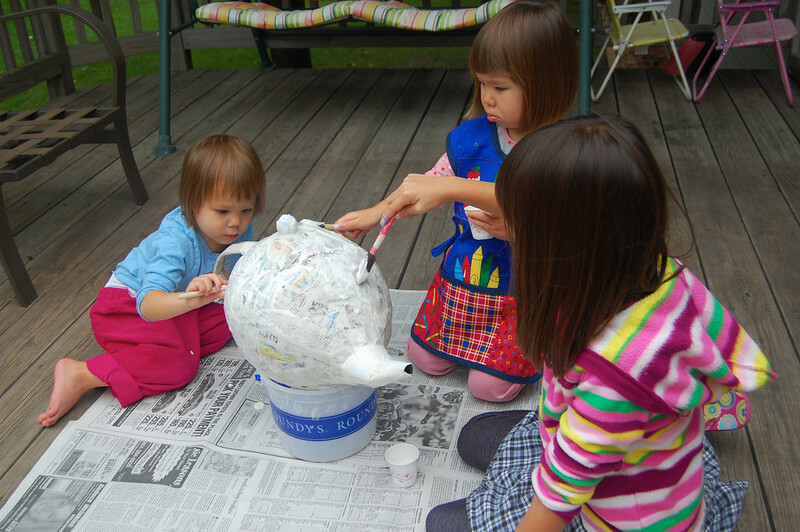 The girls chose how they wanted to decorate the teapot and everyone got messy painting it. On the day of the party, it got some good whacks. They were merciless. Here's how much the kids liked it - they beat it to a pulp even when it was down and all the loot was plundered. Hello Kitty lasted about three times as long, and expired more gracefully, but it's hard to tell if it was because it was a sturdier pinata or if the kids were a year older and a year stronger. 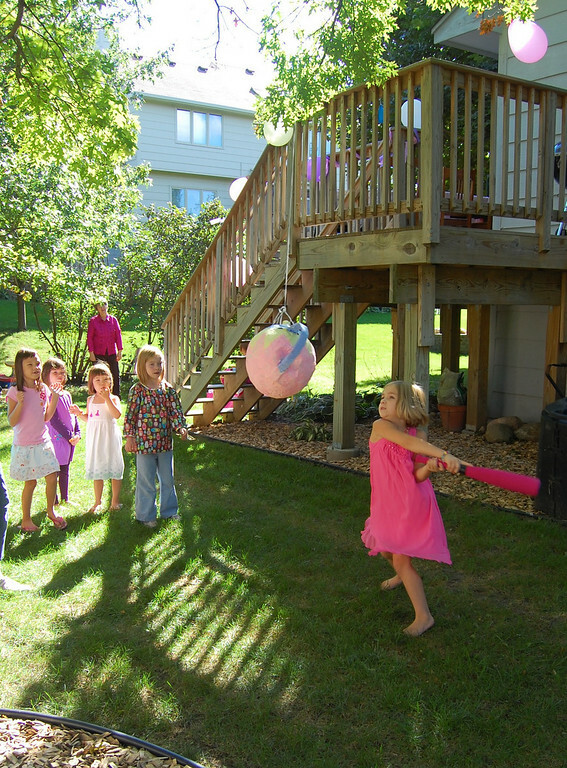 The scientific side of me is seriously tempted to invite the same bunch of kids over each year to test out different pinatas, but it would be a flawed experiment from the start, since they'd keep getting better and better sluggers. Imagine the possibilities, though, and how much fun we'll have! 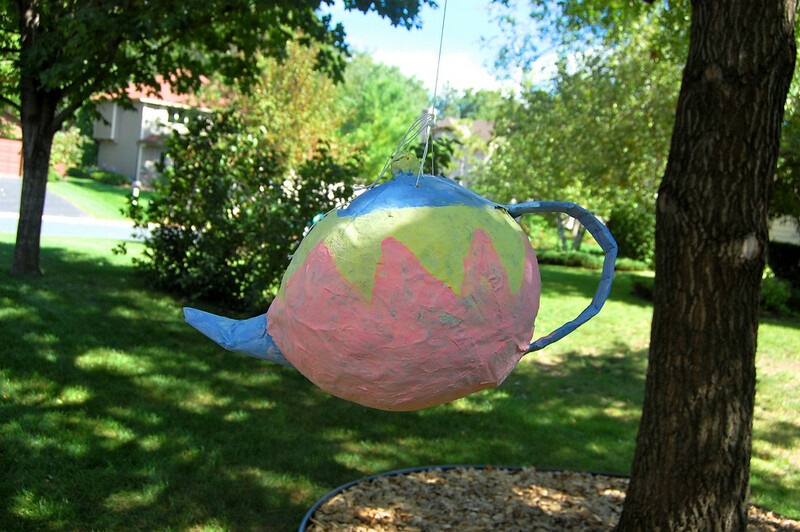 Good job on the pinata- I would of never even thought to attempt to make a tea pot one! Sooooo cute...It's a great idea! My kids birthdays are in November, but I don't care if it's blizzarding out. We are having a pinata! TOO FUN! 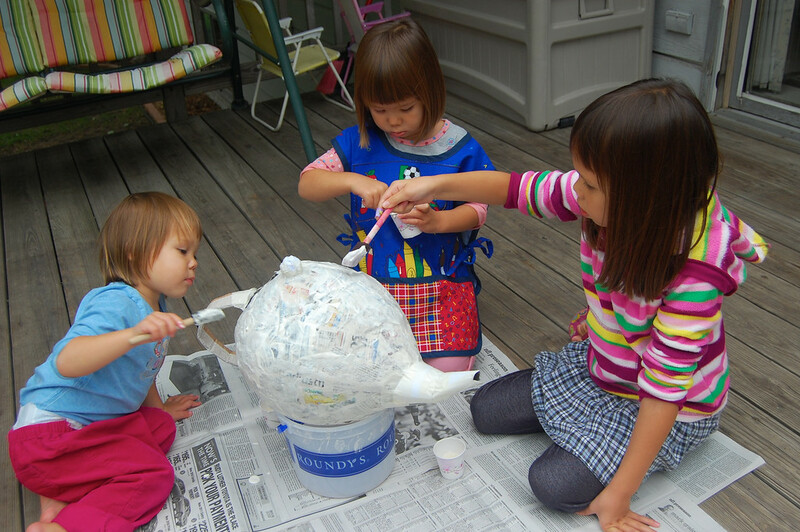 I think anyone who does paper mache with the kids is a saint. Messy, creative, fun, everything art should be to young children. I stumbled upon this blog and enjoyed it very much. Reminded me of when my two girls were little. Congratulations! Great tea pot! 2) Those purse(ez)!!!!!!!!!!!! SERIOUSLY!! if we can find a way to make fabric structured and flexible?!?!?!??! 3)OMG....... MRS. POTTS just called and thanked you for her HOLLYWOOD crazy stunt double!! Question - I think you could spin this for a teen or an adult party...how would you figure it? Everything you did for the tea party birthday party is so cute and perfect. 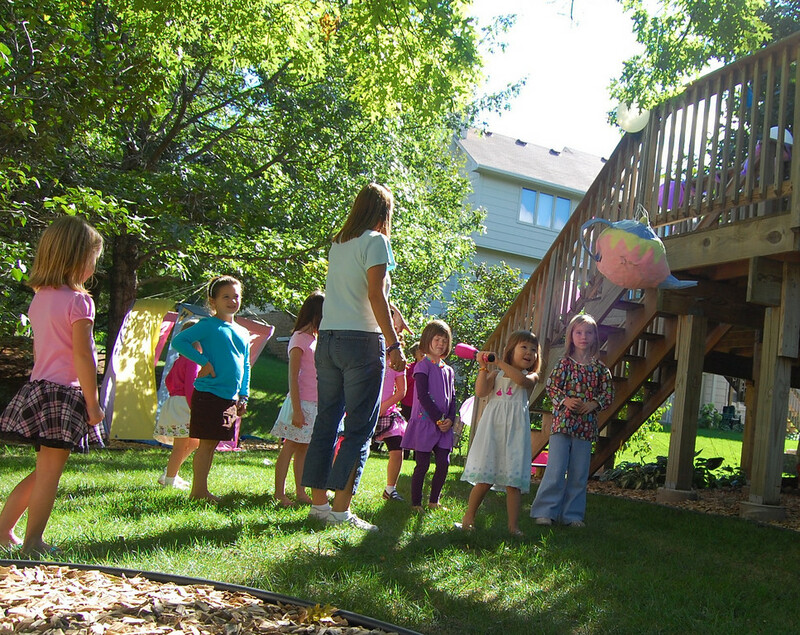 My daughter is wanting a tea party this year and a pinata. I think I might borrow all of your ideas. Thank you for your generous blog. Truly, your writing style is fun and witty! Love it! Hi Pam, and welcome to my crazy world! I did think about dumping glue in this flour-water mixture for the teapot but decided I'd do a proper, unbiased experiment and stick to just the flour and water, since I used the glue-and-water combo for the previous piñata (Hello Kitty). 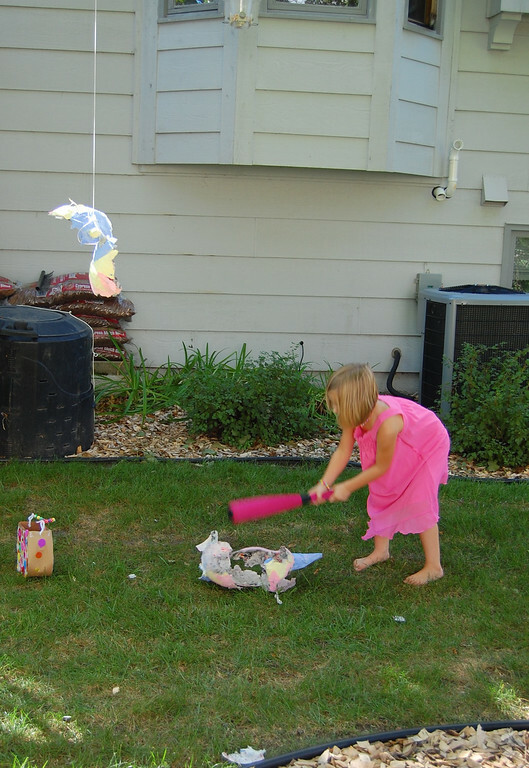 Subsequently, I've only ever used glue and water for my pinatas (we made two after this) because I like that mixture better. Not sure if I'll ever use flour again, with or without glue. Someone should try it and tell us!